FunctionChristopher Colvin, Ph.D. from the London School of Economics and Political Science, UK. 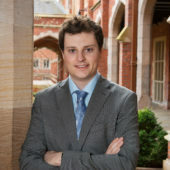 Lecturer in Economics at Queen’s Management School, and Research Associate at the Centre for Economic History, Queen’s University Belfast, UK. Dutch interwar financial history is dominated by the gold standard. This fixed exchange rate system significantly constrained the ability of policymakers to deal with the consequences of the Great Depression. The dogma of gold meant the Netherlands continued to maintain a physical connection between the guilder and this precious metal even when other countries had long abandoned the link. Understanding the consequences of this policy choice could help modern policymakers make better macroeconomic policy decisions today. Theory suggests there is a macroeconomic policy “trilemma”, whereby central bankers cannot simultaneously maintain a fixed exchange rate, wield independent interest-setting ability, and permit free international capital mobility. This is a problem because all three are needed to promote trade and industry. Today in Europe, monetary union allows us to maintain all three objectives by permanently abandoning our national currencies. But the euro is not an unqualified success story. In the past, other monetary solutions were found. The gold standard fixed exchange rate system is perhaps the most famous example. This system was reinvented after the First World War, but failed spectacularly in the 1930s. Interestingly, the Netherlands was among the last to leave it. By examining the policy history of the Netherlands in the interwar period, I hope to learn the lessons from financial history. The aim of my project is to understand how politicians, civil servants and central bankers understood the process of macroeconomic policymaking at the time, and to establish whether the trilemma trade-off existed in practice. Colvin, Christopher L. 2018. “Organizational determinants of bank resilience: explaining the performance of SME banks in the Dutch financial crisis of the 1920s.” Business History Review 92(4), pp. 661–690. Colvin, Christopher L. 2017. “Banking on a religious divide: accounting for the success of the Netherlands’ Raiffeisen cooperatives in the crisis of the 1920s.” Journal of Economic History 77(3), pp. 866–918. Colvin, Christopher L., Abe de Jong and Philip T. Fliers. 2015. “Predicting the past: understanding the causes of bank distress in the Netherlands in the 1920s.” Explorations in Economic History 55, pp. 97–121.